This interesting name, with variant forms Altimes and Alltimes, is of German topographical origin from residence in or by an ancient dwelling. The derivation is from the Old German "alt", meaning "old", plus "heim", a home or dwelling. A Coat of Arms granted to the Altheim family of Bavaria circa 1680, is recorded heraldically in Riestap's "Aromoial General", and is a silver and red shield divided vertically. 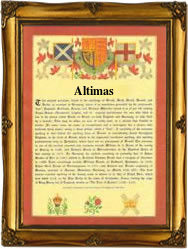 The Coat of Arms of the Altheims of Souabe depicts a blue demi lion rampant on a silver shield. A Palatine family (probably from the Upper Palatine territory, now in Bavaria) settled in Southern Ireland in the 18th Century where the name was recorded as Altimes and Alltimes. Phebe, daughter of Daniel Alltimes, was christened in Rathkeale, County Limerick, on August 8th 1790, and Anne Altimes married a Patrick Sherwood on March 2nd 1813, in Kilfinnane, County Limerick. John Cormack Altime, an infant, was christened in All Souls, St. Marylebone, London, on December 25th 1825. The first recorded spelling of the family name is shown to be that of Leonard Alltimes, (marriage to Mary Buckle), which was dated 1772, Ballyhay, County Cork, during the reign of King George 111 of England, "Farmer George", 1760 - 1820. Surnames became necessary when governments introduced personal taxation. In England this was known as Poll Tax. Throughout the centuries, surnames in every country have continued to "develop" often leading to astonishing variants of the original spelling.